Opting up to ECO100 is a powerful action you can take to help the earth, and it’s easy! 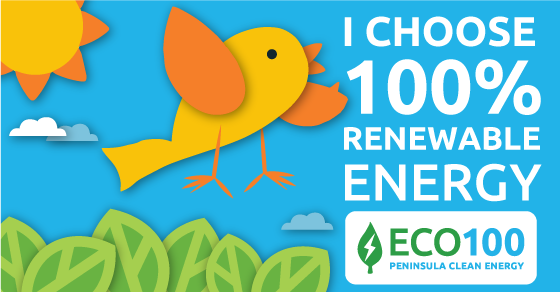 ECO100 is 100% renewable electricity from Peninsula Clean Energy. It’s an incredibly easy and cost effective way to go green. ECO100 rates cost just 1 cent per kilowatt hour more than ECOplus rates. For the average household, this premium is only about $2.50 more per month than what you would usually pay PG&E, or less than the cost of one coffee. ECO100 is Green-e Energy certified, and meets the environmental and consumer-protection standards set forth by the nonprofit Center for Resource Solutions. Learn more at green-e.org. To view highlights of the conditions of your subscription, see the Price, Terms & Conditions. For a complete list of the resources included in ECO100, view the Prospective Product Content Label. Complete the form below to opt-up to ECO100 and receive 100% renewable and carbon-free energy from Peninsula Clean Energy! Let your friends know that you chose ECO100! Hit the share button below to let your friends know about your powerful choice to opt up!